If you’ve ever lived in or visited a beach town in Southern California, you may have noticed that some stores occasionally, and quite unexpectedly, close in the middle of the day. Well, unexpectedly IF you’re not paying attention to the surf report. And I rarely did, even when I lived a mile from the beach. 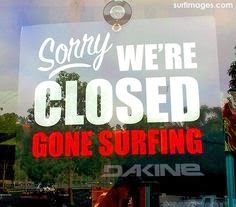 So, finding a store suddenly closed during normal business hours was a fairly regular experience, the store keepers having grabbed their boards, locked up, and headed to the beach. Even in the midst of my annoyance at this sudden inconvenience, though, this interruption in the momentum of my day, it was genuinely hard not to admire people who so unapologetically put “pleasure” at the top of their “to do” list. I haven’t lived in Southern California for quite a few years now, and I have never been bold enough to suddenly hang out the “closed” sign in the middle of the day, until recently that is. A few months ago I began experiencing the kind of down-to-the-marrow fatigue that cannot be ignored. It didn’t take much thinking to understand where it was coming from — once again I had taken on too much, said “yes” to things that I should have thought over (and then said “no” to), and generally stepped right back on the treadmill of busyness that I have sworn time and again that I would avoid. This time, however, instead of feeling discouraged, I decided to see this as progress — I’d noticed the situation earlier this time, and knew that “pushing through” (as I’ve done so many times before) was not the smart choice. Posted on March 29, 2014, in Parenting. Bookmark the permalink. Leave a comment.